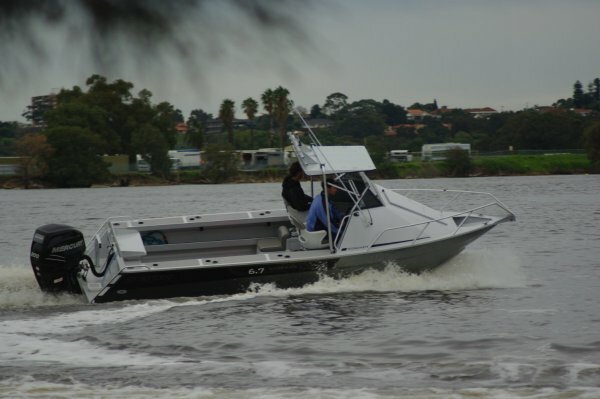 The review boat has the same aluminium hull as the 2011 Imported Boat of the Year. The upper works, though, are abbreviated to make more cockpit for fishing; hence the blokey name Surtees 6.7 Workmate. It works for me. 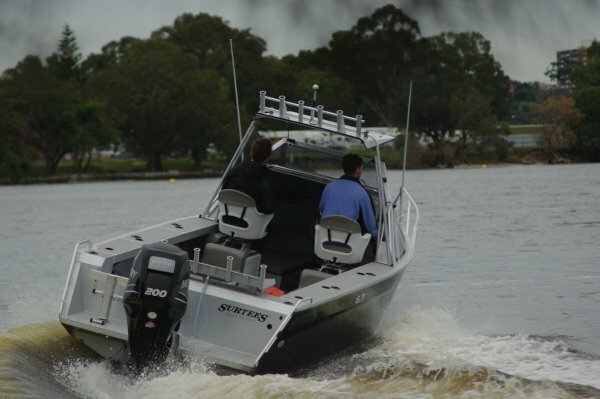 Surtees is the New Zealand boat builder that pioneered, if it did not invent, the automatic water ballasting and de-ballasting that keeps a deep Vee boat stable when it stops moving. It created a lot else besides, including an inspired starkness that makes the Workmate the most purposeful of fishing boats. 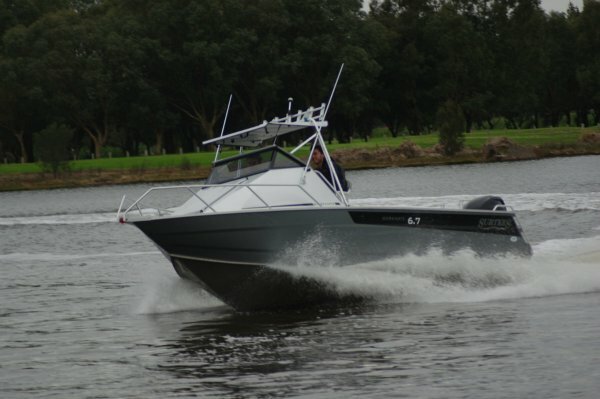 Aft of a short, open reared cuddy cabin the 6.7 has a driving position protected by a hardtop. If conditions get extreme, the front edge of the hardtop can drop down to the top of the windscreen to keep spray and green water out. For trailing, the entire windscreen structure hinges aft and drops into the cockpit to reduce wind drag. Within the protection of the hardtop and the side glass is a pair of very acceptably comfortable seats mounted on boxes ahead of jump seats. Typically New Zealand, the comfort diminishes as you move aft. At the transom, the drop-down bench is light on for padding but is in the low movement area and does an acceptable job. 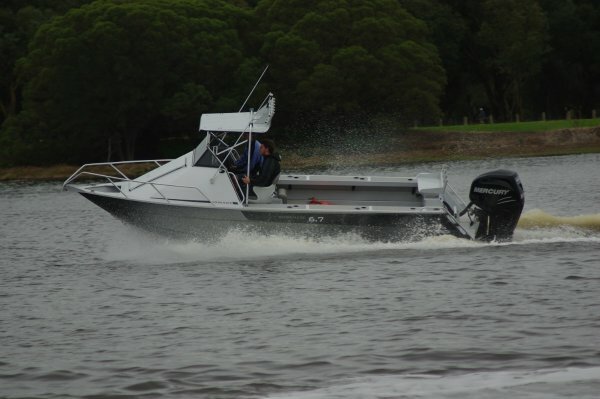 The six or seven the seats cater for is rather more than comfortable fishing numbers. The four in first class is about right, and they get first class facilities. A capacity for 16 rods, a live bait tank with a glass front, a catch tank, a burley tube, and a bait station mounted at exactly the right height. The coaming height is fisherman friendly too, at the expense of a self draining deck. Which is possibly an overrated attribute: perhaps more important is the sealed deck that does not let traces of bait and stray fish hooks sneak their way down to the bottom where they can cause smells and corrosion. The coamings are wide, delivering at least three benefits. They add rigidity, they keep standing anglers’ weight closer to the centerline – and they make great seats for the more casual fisherman. The height is spot on. The deck and the side pockets are covered with the plastic reed material that may well be the best cladding of all: easy to clean and easy on the feet. The deck runs level through into the cabin, which makes do without a rear bulkhead. There are seats rather than bunks in there with storage bins under. The section of seat right forward lifts out to uncover the step up to the only practical access forward, the fore hatch – a huge opening with a solid lid. The driving position is good, and particularly well set up for a standing driver. He gets plenty to hang onto and a large fiddled shelf in front. Little goodies like drink holders are absent but not missed in this immensely practical boat. It has the more important things like anti slip material on the coamings, the beefiest scuba ladder afloat, a superb ride and good stability at rest. 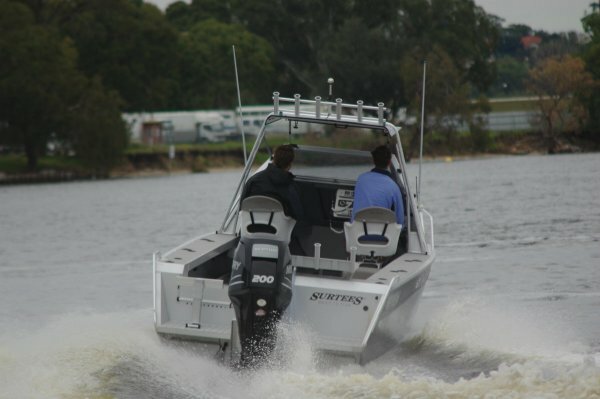 The 200hp Verado provides abundant urge. From rest it has to contend with several hundred kilos of water which were fired out the back within seconds of our opening the throttle. Once moving the Surtees proved a delight: responsive to trim, fingertip-light steering, not a suggestion of propeller ventilation in the tightest and fastest of turns. Driving back onto the trailer was as simple as it could be. The trailer was equipped with Surtees’ neat and simple catch and release for one-man launch and recovery. It also had a heavily braced winch post. In New Zealand beach launches are common, which means they have to contend with wash aways under trailer wheels. That post allows the thrust of the outboard, in the Verado’s case something like a tonne, to help the tow vehicle get moving. Just one more practical touch.